Here at Smith Family Dentistry, your dental health is our number one concern. As your providers of general and cosmetic dentistry in Charleston and South Charleston, we’re able to offer you a variety of different dental treatments to help you maintain healthy teeth and gums. One such way that your Charleston dentist is capable of helping out your gum (or periodontal) health is through the utilization of ultrasonic scalers. While you may not know what ultrasonic scalers are, there’s a good chance that your teeth are very familiar with them. Ultrasonic scalers are one of the tools that many dentists and dental hygienists use to remove dental plaque, calculus, and the buildup of stains from teeth. Not only can they clean the crown of the tooth, but it can reach below the gums and clean the roots of the teeth – areas that you can’t reach with a simple toothbrush. This will help eliminate bacteria beneath the gum line and prevent gum disease. How Do Ultrasonic Scalers Work? Electromagnetic forces course through the ultrasonic scaler to cause its tiny tip to vibrate rapidly. The vibrations fall into the ultrasonic range as they move so fast – around 25,000-to-45,000 times per second! Its tremendously fast motions allow the tip of the ultrasonic scaler to easily break up hardened deposits on the tooth without damaging it. Some tips are fine enough that they’ll be able to be used on the roots of the teeth as well. Because the tip of the ultrasonic scaler moves so fast, it can remove tough stains and tartar incredibly fast. However, because of that, it needs to be cooled by a constant stream of liquid – a process that’s known as lavage. Lavage won’t just keep the tip from overheating, but it’ll flush debris away from the treatment area and create millions of tiny bubbles – an effect called cavitation. Cavitation is very effective at rupturing the walls of bacterial cells and disrupting the environment that houses harmful bacteria. Who Should Undergo Ultrasonic Scaling Treatment? We recommend visiting your providers of general and cosmetic dentistry in Charleston for ultrasonic scaling if you need to have a deep cleaning, whether it’s above or below the gum line. This treatment can be used as a preventive measure for those who may be susceptible to periodontal disease. 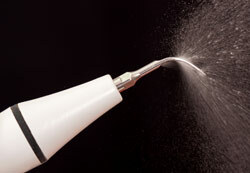 In plenty of cases, ultrasonic scalers will be used along with traditional hand scalers for a more thorough cleaning. In terms of effectiveness, safety, and comfort, ultrasonic scaling is one of the best methods of non-surgical periodontal therapy. Let your Charleston dentist know beforehand if you have a cardiac pacemaker or hypersensitive teeth so that we can take the proper precautions. Please also inform us if you have titanium implants, composite or porcelain restorations, or areas of demineralization on your teeth as we may need to use special tips in these circumstances. Come Visit Your Dentist in Charleston and South Charleston! If you’re interested in a dental exam, ultrasonic scaling, or dental implants in Charleston, WV, we encourage you to give us a call at (304) 343-9131. Alternatively, feel free to fill out our online appointment request form to schedule a visit with your Charleston dentist. We’re looking forward to seeing you and making sure that your teeth and gums are as healthy as possible!